Canoe Marathon races take place all around the world over courses of very different types. Competitors range from new comers struggling to complete a 4 mile course to hardened marathon racers used to racing over extreme distances. Canoe Marathon is the name given to marathon racing in both canoes and kayaks by the International Canoe Federation (ICF). Marathon Racing is not an Olympic sport but World Championships, European Championships and World Cup races are held every year for both seniors under 23 and juniors over set distances. The ICF has a set of rules the essential elements of which are widely adopted by races with a great variety of formats. This means that there is a general framework for boat specifications, rules of overtaking / manoeuvring, portaging etc. that are common to most of the major races around the globe. The type of start used for a marathon race makes quite a difference to the nature of the race. If all paddlers start on a line together it becomes extremely important to get a fast start to get a good place on a wash. If the start is a time-trial type then its all about pace judgement and mental discipline, on a a Le Mans style start with a lot of boats an ability to survive a bit of carnage can come in handy! At World Championships paddlers names are drawn and numbers allocated at random. Athletes line up in number order and back onto a pontoon. The back of the boat is held by a boat holder on the pontoon and released when the starter say s go. This allows for a very fair start. Given the quality of the field and the number of paddlers involved these are exciting starts to watch as everyone jostles for the best position in the pack over the first hundred or so metres of the race. Few venues or races have the space or resources to run held starts so many races have a start line marked on the banks of the river or lake and a starter has to control the paddlers, getting them to form a fair line before issuing the instruction to go. Paddlers should co-operate with the starter to get a fair line but with the importance of getting a clean start it takes a strong personality to control many start lines. Most Domestic racing in the UKs Domestic Hasler racing series is started like this. In a Le Mans start the paddlers line up with their boats on the bank sometimes in a pre-determined order, sometimes randomly. At the word go from the starter the athletes pick up their boats and run into the water climbing into their boats to start their race. A famous example of this type of start would be the Sella Descent in Spain. By contrast to the previous starts, time trial type races involve paddlers in setting off as individuals or in small groups. Each is given a start time and the total elapsed time determines the paddlers result. Famous examples of time trial type starts include the Devises to Westminster Canoe Race and the Waterside Races that precede it. Wash hanging is one of the principal skills of canoe marathon races that sets it apart from sprint racing. In a similar way to slip streaming in cycle racing paddlers use the wave created by the paddler in front to go faster for less effort. The start is critical because this is when packs of boats form and work together to break away from those who do not get away as fast. Using each others washes in turn a group can paddle faster than a lone paddler of similar ability who gets left behind. Race tactics involve sitting on washes as much as possible letting fellow competitors do as much of the "work" as possible. The less time spent at the front working hard the more is held in reserve for a sprint at the finish or a break from the pack at a portage or turn. 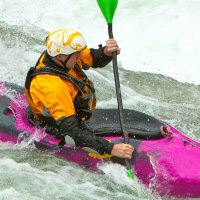 Because of the long distances involved in marathon racing it is often necessary for paddlers to carry their boats around an obstacle such as a lock, weir or area of extremely shallow water. This is called portaging and in some races there are many portages. Slick portaging is a skill learnt by much practice, with lightweight boats and well trained athletes some very fast portaging can be seen. False portages are often put into races where no obstacle exists to make the race more challenging and to make for good spectator sport. 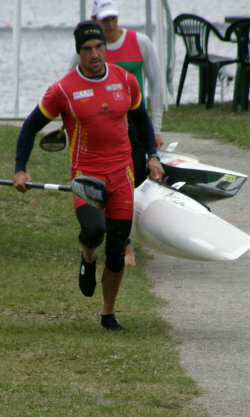 Marathon racing kayaks are specialist in nature. Make sure you know what to look for. Many marathon paddlers also sprint. 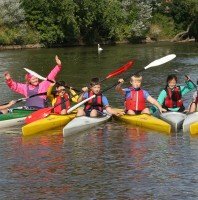 Boats, technique & training are similar. 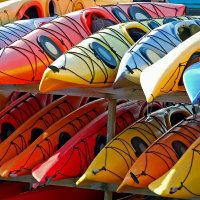 Generally the best way to get started in the competitive side of canoeing is to join a club. Find out where the closest club is that has active marathon paddlers. If you express an interest in racing and training most clubs will welcome you and help you progress. There is a huge amount of enjoyment to be had from competing at any level and fitness and competency will come with experience and a whole new social circle of like minded people. Descent races are marathon races held down rivers often with weir shoots and or portages. Some of the weirs that are shot are not small! Survival without capsize can save significant amounts of time but with the size of weirs and the instability of the boats staying dry cannot be guaranteed by even the most experienced crews. The boats used will tend to be slightly more forgiving in stability but will be fitted with understern rudders and are prone to damage. Examples of Descent Races are the Lifey in Ireland and a range of races in South Africa e.g. the Fish River marathon. South Africa is particularly known for its descent racing. Ultra distance marathons are very varied in nature. Some will take place over a number of days others might run overnight. Distances covered can run into the hundreds of miles. 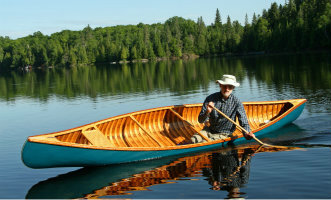 A classic ultra canoe marathon is the Devises to Westminster Canoe Race which is 125 miles long and includes 73 portages. A “Classic Series” has been created with a number of races around the World included. The format for these events is set up to encourage spectators and is therefore run on courses which enable the distance to be covered in a series of laps with artificial (or real) portages. Seniors Men paddlers race over 26 miles 34km and the course is set at 8 laps of 4.?km with 7 portages. Senior Women and Canoes race 1 lap fewer and Juniors race 1 lap fewer again. There is a very popular masters racing event held alongside these World and European championships with some very high standard and competitive racing.